This wine has a light golden color, with delicate aromas of tropical fruits such as pineapple with notes of mandarin orange and honey. The palate is fresh and well-rounded. The grapes for this single-vineyard wine come from the Molina area, close to the Andes Mountains – one of the coolest sectors of the Curico Valley. Hand-picked at the end of March, the grapes are crushed, and undergo two hours of cold maceration at 46° F. Fermentation takes place in stainless steel tanks for 25 days at controlled temperatures (55-56° F). 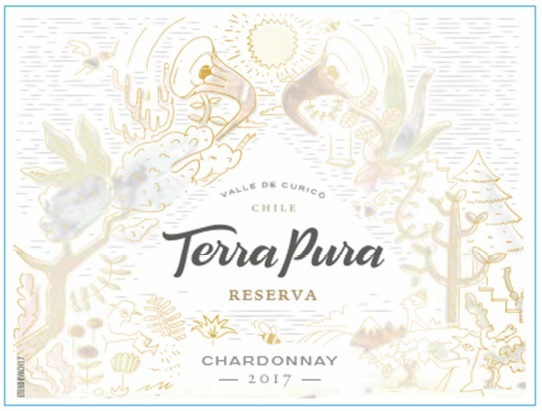 The Terra Pura illustration on the label seeks to convey the importance of maintaining the ecosystem in which humans, plants and animals coexist. The trumpets/speakers at the apex of the illustration represent the importance of listening to what nature has to tell us. Terra Pura Chardonnay is perfect to accompany salads, mild cheeses, and fatty fish such as salmon.